The Deity of Thiru-Kachamkurissi, venerated as ‘Perumal’, is Chaturbahu Mahavishnu, holding Sankhu, Chakra, Gada and Padma. 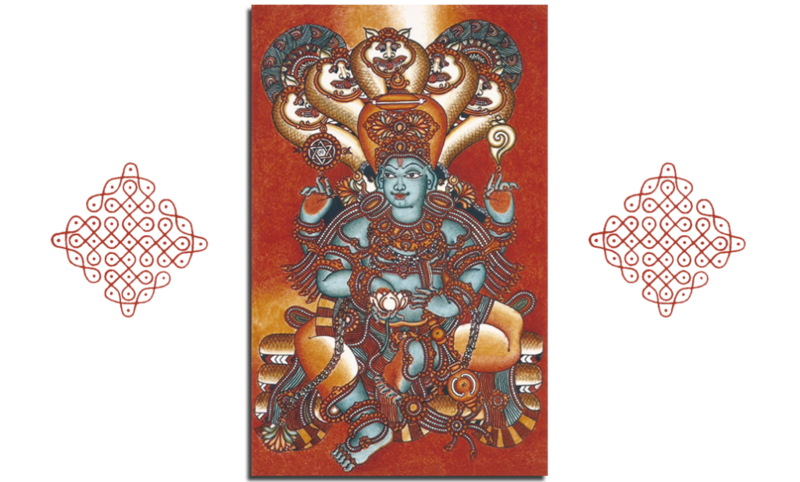 He is seen, seated on the coils of Ananta, in ‘Chakravarthy’ posture – akin to Sri Rama at his Pattabhishekham. Thus, devotees are known to have approached him over the centuries, both as Lord Narayana and as Sri Rama. The idol is ‘Daaru Vigraham’ – of sacred wood (though wooden idols exist in the temples of Kerala, they are rare, the majority of images being of stone and metal). On the same pedestal as the deity, visible to the viewer only through reflective mirrors, are the images of Sridevi and Bhoodevi – consorts of Vishnu. All around are carved the Devas and Rishis – spectators and attendants at the ‘heavenly audience’. There is also a smaller deity within the sanctorum, which is the ‘Abhishekha Murthy’, as well as a Panchaloha ‘Utsava Murthy’ which is taken out in procession thrice a day during the ‘Seeveli’. The Mantra of the Deity, as passed down the ages, is ‘Om Namo Narayanaya’. It is also common to hear devotees chant ‘Hare Rama’, since the outer wall of the Sreekovil is encircled by frescoes of the Ramayana.